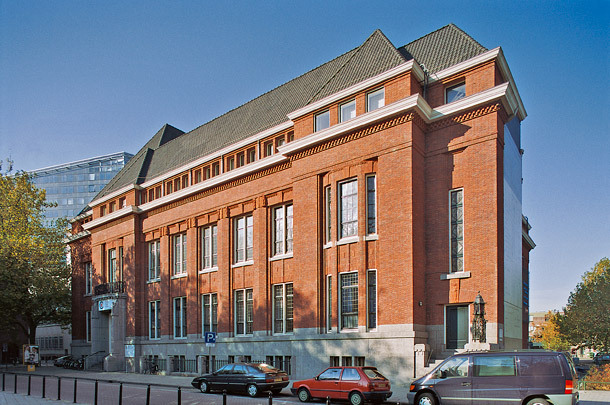 These former premises of the Central Library survived the 1940 raid on Rotterdam. In 1983 the library relocated to new premises a few hundred metres to the south. Home from 1989 till 2012 to the National School Museum, Nicolaas Lansdorp's building has restrained lines and a distinct Amsterdam School feel. The book issue desk, catalogue and newspaper reading area used to be on the ground floor, with the reading rooms upstairs and the book stacks in the basement. The Nationaal Schoolmuseum has moved in 2012 to the former office building for insurance company De Holland in Dordrecht. The library is used as University College.